Towards the end of our time in central Oregon we made it our mission to explore as many waterfalls and geologic wonders as we could. On this day we left our campsite in the McKay Crossing campground outside of La Pine and headed east to check out several areas of interest including Paulina Falls and the Big Obsidian Flow. 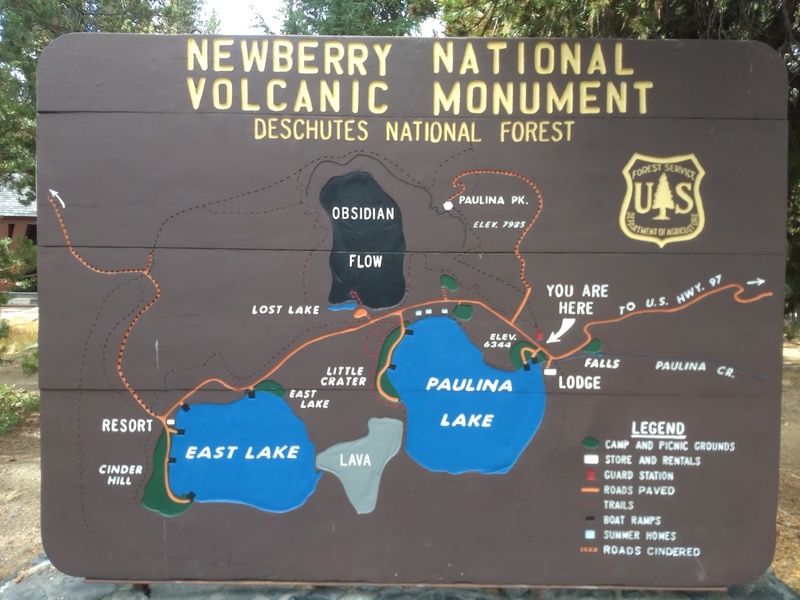 After our stop at the falls we took a look at our map of the area and saw that Paulina Peak, the highest point on the Newberry Volcano was accessible by car and so made that our next target. A half mile further down the road from the Paulina Falls parking area is the Paulina Visitor Center (which was closed for the season when we were there). Before leaving we stopped and took a picture of the informational map out front to get our bearings. A short .2 miles past that, on the right, is Forest Road 500 which leads up to the summit. The twisting dirt road offers many vistas out at the surrounding area but on this day the mountain was still in a blanket of clouds and visibility was restricted. Slightly less than 4 miles from turning onto the Forest Road we arrived at the summit. You’re Blocking The Sign Girlie. Her Capable Tacoma In The Background. It was still heavily clouded in when we got there a little after 10:30 in the morning and we pulled into one of only six or so, obvious parking spots although several more cars would fit. Just like at the Paulina Falls parking area we were the only ones there. 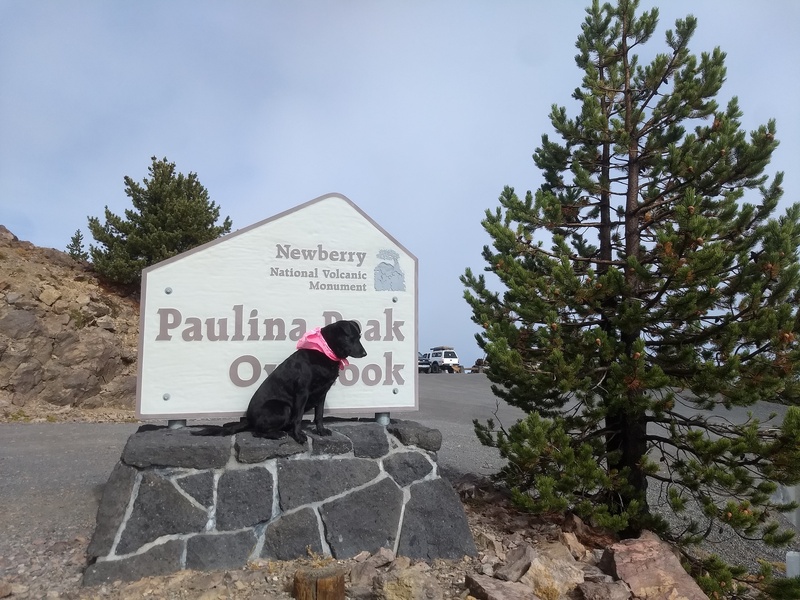 After parking we took a quick look around and read the couple of information signs talking about Whitebark Pines and the dangers they face from disease and Mountain Pine Beetles as well as the elevation sign to the left of the parking area. Highest Point On The Newberry Volcano (2434 m). Paulina Lake 1652 ft (504 m) Below. To the left of the above sign is a 3/4 mile, self-guided nature trail showing and explaining in more detail the challenges to the continuing survival of the Whitebark Pine species. 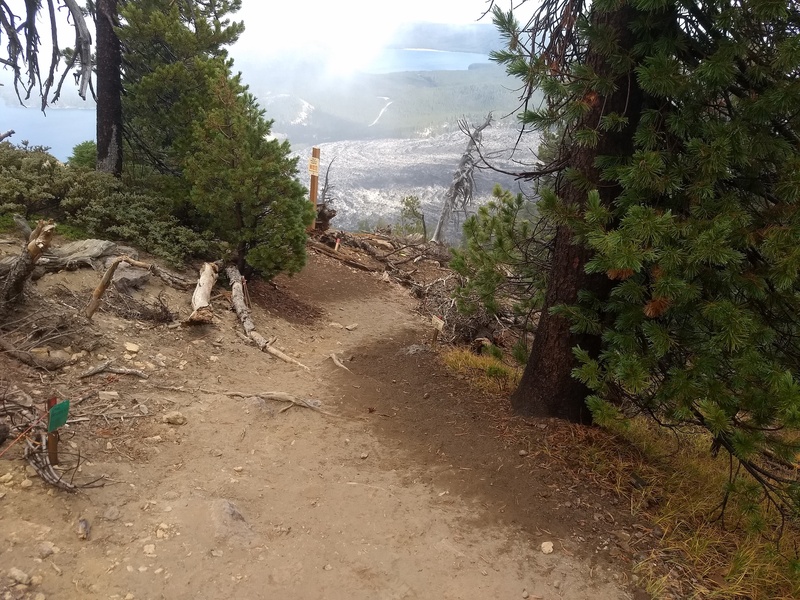 To the right of the parking area is a short, narrow dirt path leading out to some breathtaking views of the surrounding area including a view down into the Newberry Caldera itself, the opposite flanks of the Newberry Volcano, the Cascades and, if it was a clear day, much of central Oregon. On our way down the path we noticed several spots of moisture on the ground and could see that they were directly under overhanging trees or bushes. These dark spots of moisture on the ground generally corresponded to the dry spots we would expect to see protected from above by trees or brush after a rain. There was no rain at all the night before and so we at first assumed there were sprinklers targeting these areas but that was not the case. Instead we surmised one of two possibilities – that the change in temperature at this elevation overnight had caused condensation to form on these trees and the wind had knocked it off recently or the moisture in the clouds that hung thick over the summit overnight had been trapped by these plants and then condensed to droplets that fell to the ground earlier that morning, much like a fog catcher. At the end of the short trail we were rewarded with an almost stunning view below us but it was still somewhat hampered by the remaining cloud cover. 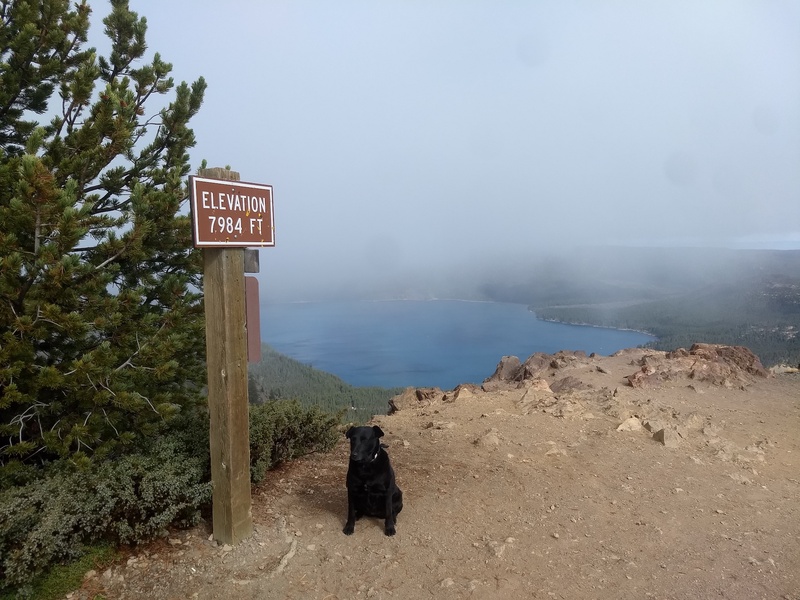 We immediately took notice of the large lava flow below us and to the right, knew there was a place called the Big Obsidian Flow just down the road, expected this was that and so decided to head that way next. If you have ever been to Crater Lake you know that the one, main volcano (Mt. Mazama) in the area blew its top and then collapsed to form the caldera that eventually filled with rain water and became Crater Lake. 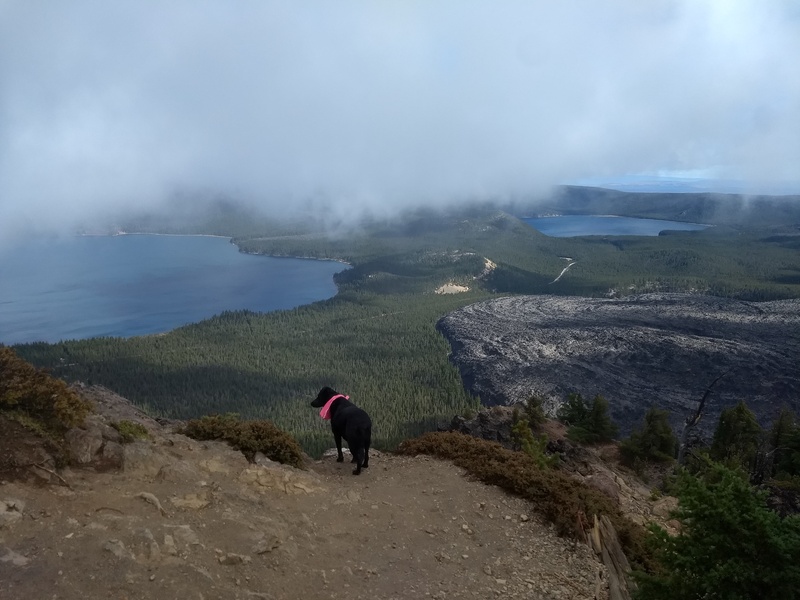 While named in the singular, “Newberry Caldera,” the volcano and the existing caldera are in fact the remnants of hundreds of smaller volcanoes that were active in the area for about 1 million years. Each spewed forth its molten gift one after the other (and sometimes at the same time) pushing into and layering on top of one another. Over time the shared, main magma chamber deep underneath the area had lost enough material and pressure to quiet the eruptions and eventually all these separate volcanoes collapsed leaving one large caldera. That eventually filled with water and became one large lake. Continuing volcanic activity added material and pushed upwards eventually separating the large lake into the two existing lakes we see today. Geology is cool…or in this case Hot! Yes, I am a dork. As we were walking back up towards the parking area the breeze picked up, the sun peaked out a bit more and the remaining clouds began to lose their hold on the summit and skyline. After a few more pictures and a quick stop at the vault toilet up there we headed back down the road heading toward our next stop this day, the Big Obsidian Flow, which we will post about soooon. Here is some more information about accepted Recreation Passes and Permits. 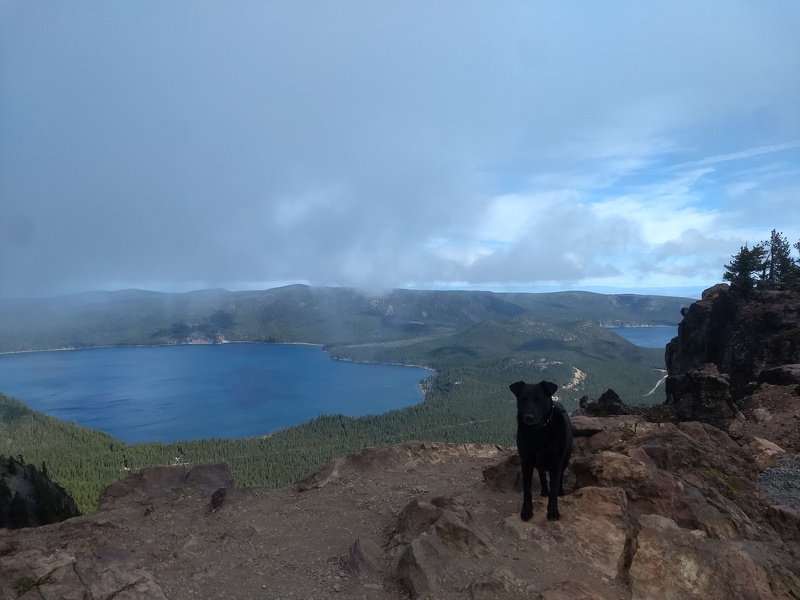 As with Paulina Lake and Falls there are numerous sites to explore in this area that are all within a short drive from one another and this should, for sure, be added to your list if you are in the area.